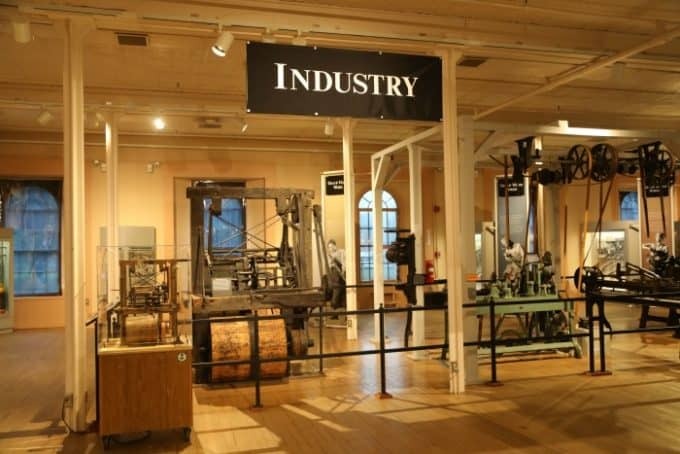 Springfield Armory National Historic Site in Massachusetts was the nations armory for over 174 years. Starting in 1777 during the Revolution War when the armory was established. The armory was created to manufacture ammunition, repair and store weapons along with maintaining artillery. After the US won its independence in the revolutionary war President George Washington ordered the Springfield Armory to manufacture flintlock muskets so the new nation wouldn’t be dependent on anyone else. For over 174 years the Springfield Armory was open until 1968. The armory developed and manufactured America’s military weapons including many famous guns/weapons that can be seen at the Armory. 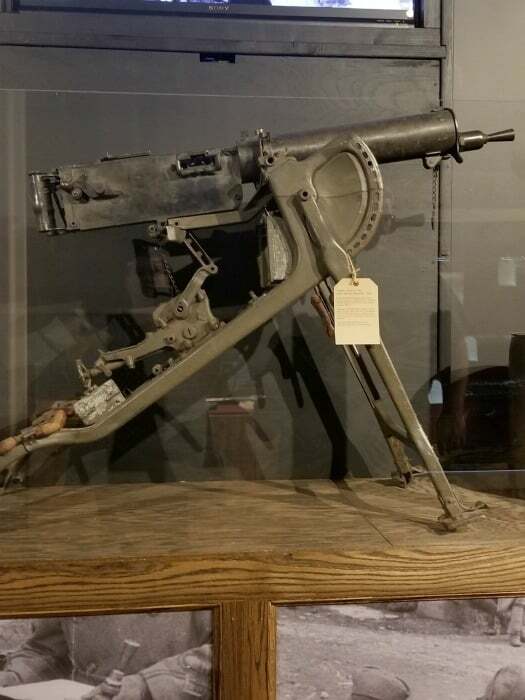 A few of the most famous arms that are on display at the Springfield Armory NHS include the muzzle-loading Springfield rifle of the Civil War, the bolt-action Springfield Model 1903 from WW1, and the Springfield M-1 Garand rifle of WW2. The Springfield Armory houses the largest collection of American military shoulder arms in the world. The visitor center is the heart of the armory. You can’t really miss it unless you are there when the park is closed. 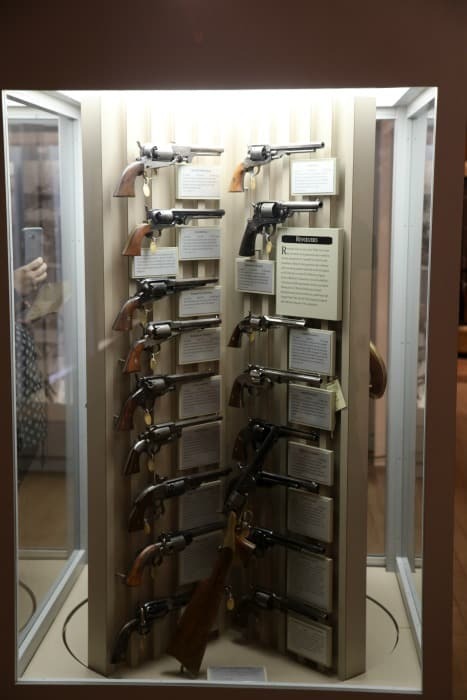 The visitor center has all of the displays of guns and information on the park. The junior ranger program can be completed within the Springfield Armory. Depending on the age of the participants they may need adult help. Many of the questions are based on specific gun cases and the guns that are found in them. I would suggest 45 minutes to 90 minutes to complete the program. There is a page of word searches and a couple of other easier pages to be completed. When I turned my program in the ranger checked each answer and helped me know which guns I had switched by mistake in the booklet. 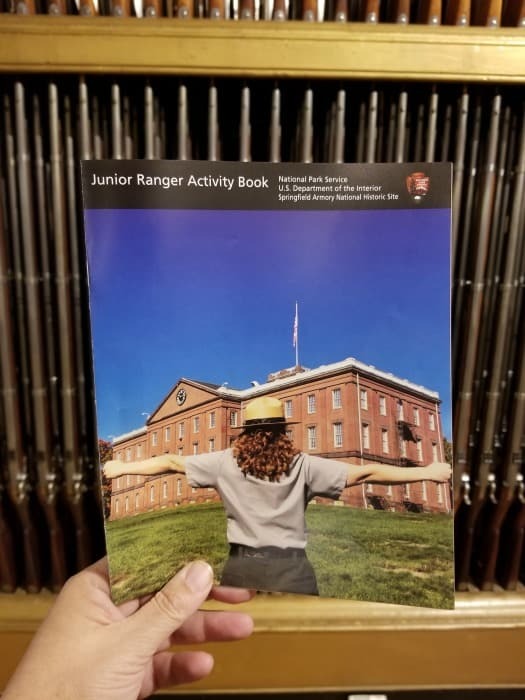 The Junior Ranger program is a great way to learn more about the work that was done at Springfield Armory. The museum at Springfield Armory NHS is in the main Arsenal Building from around 1848. 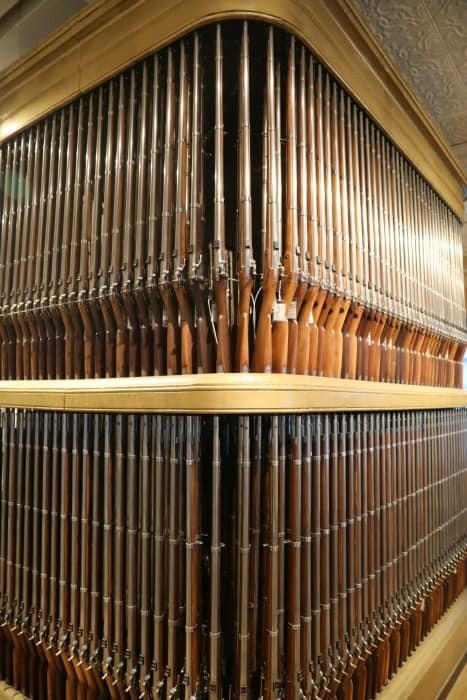 The tour takes you through the production area and into a museum of gun cases. The cases of guns show the evolution of guns from the early production to when the Springfield Armory shut down. 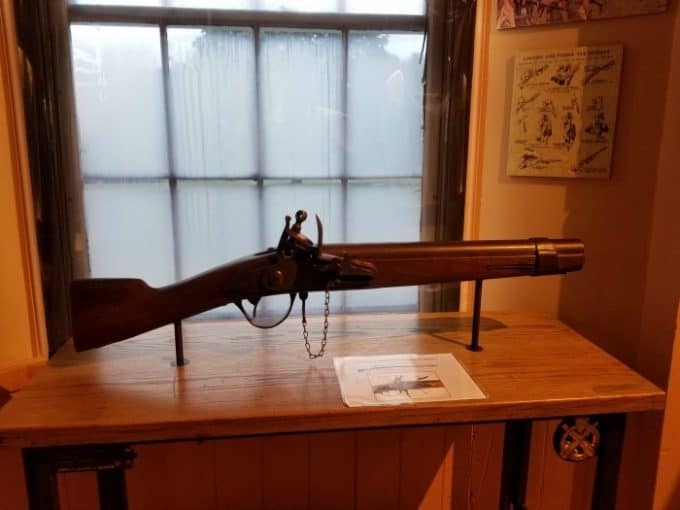 It is a great way to see how guns evolved during war and from heavy use. The 20-minute documentary is a great way to learn about the history of the Armory. I found it fascinating and learned a lot about the work that was done at the armory and how it came to be. For GPS directions – 1 Armory St., Springfield, MA. 01105. When you drive onto the community college campus be prepared for students to be everywhere! This is definitely a parking lot to drive slow in and be aware of all the people. There is designated parking spots for the Armory right in front of the building. 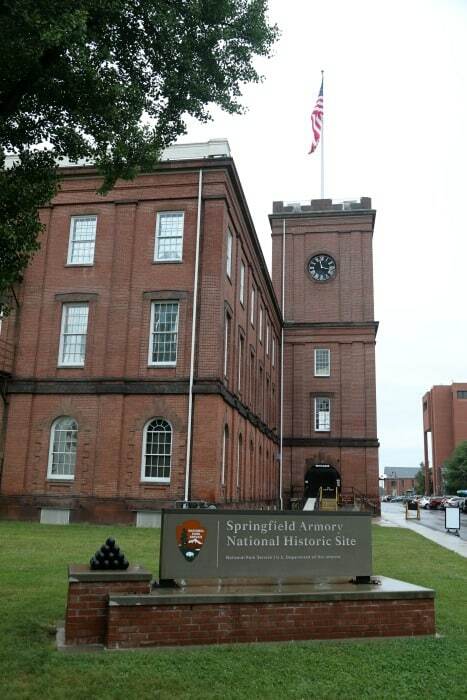 Memorial Day through October 31, Springfield Armory National Historic site is open seven days a week from 9 am to 5 pm. November 1 until Memorial Day Weekend, Springfield Armory NHS is open Wednesday through Sunday, 9 am to 5 pm. Closed on Thanksgiving, Christmas and New Year’s Day. Check out all of the great Massachusetts National Parks you can visit!